Nearly all tanks in the British Army by WW2 were those ordered or requested designs. 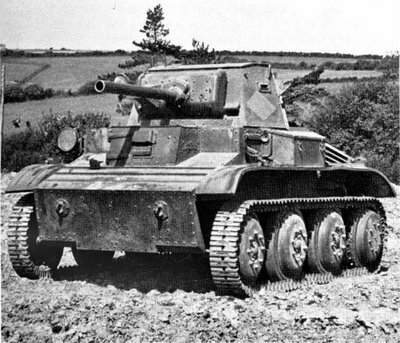 The British Tetrach Light Tank A17 however was a private development that was then offered to the British Army and accepted in to service during 1938. Classed as a light tank, it entered production in 1940, however this halted soon after, as the lessons of Dunkirk was showing the British Army that light tanks would no longer have an effective future as the war progressed. However with the development of Airborne Forces, the vehicle proved ideal for deployment by Hamilcar gliders and production of 177 vehicles commenced in 1941. These formed part of the 6th Airborne Division efforts during the Normandy Landings and others were sent to Russian Forces, which proved unpopular.